Thoughts from Polly's Granddaughter: Update - Call to Action! ~ "Little Deer" is back! Update - Call to Action! ~ "Little Deer" is back! Update - I just got a response to the email I sent to the library requesting they cancel Little Deer Durvin's speaking engagement. Kinda obvious they don't care. received several comments on a program with Mrs. Durvin scheduled here for Nov. Remember "Cherokees Demand Truth from Carolyn Emerson Durvin (aka "Little Deer Durvin")? Carolyn Emerson Durvin was exposed as an ethnic fraud. I'd hoped that would be enough to make her rethink her behavior, but it wasn't. She is scheduled to do Cherokee storytelling at the Ridgecrest Branch Library on November 9, 2013. As if it isn't bad enough she is going around pretending to be Cherokee when she isn't, she is also spreading a false Cherokee history in order to allow herself to fit into that history. Enough is enough. 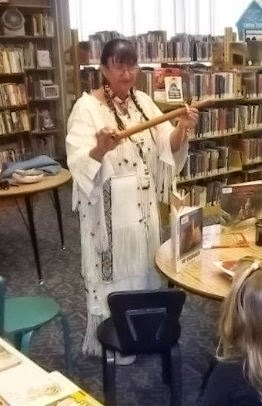 Please contact the Ridgecrest Branch Library and let them know Carolyn Emerson Durvin, aka Little Deer Durvin, is an ethnic fraud, and that you as a Cherokee, an American Indian, or an American citizen are offended that a library would allow a fabricated history to be taught to children. Ask them to cancel her speaking engagement. Or contact the Kern County Library (Ridgecrest is a branch of this library) by filling out this "Contact form." I follow your blog regularly (I think it is wonderfully done:)), and I wanted to send you a copy of the letter I sent the Ridgecrest Branch Library in protest of the appearance of Carolyn Durvin. I am not Cherokee, but fraud makes me angry whenever I see it, particularly when it involves children. Best of luck with your blog and keep up the good work! I am writing to protest the appearance of Carolyn Emerson Durvin (AKA Little Dear Durvin) at an event at your library on November 9th. Carolyn Durvin has been exposed by several Cherokee citizens and reputable genealogists as a fraud. Her family connection to a Cherokee chief via a great grandmother has been proven false, and by knowingly allowing her to present herself as Cherokee to a group of impressionable children, you do both the native community and your patrons a disservice. Justifying her appearance by stating that she will 'talk about her own life experiences' does nothing whatever to justify her appearance as she is not Cherokee and cannot, in fact, authentically convey the Cherokee experience. As a teacher of elementary aged children I am appalled at this deception on their behalf. Carolyn Durvin's lack of registration is bad enough---but it appears at this point that she may not have Cherokee blood at all, making her an out and out fraud. Please act responsibly in this matter and cancel her speaking engagement at your library. Thank you. I can't help but notice that on the Ridgecrest Branch Library's Facebook page, several posts that people made over the course of the day objecting to "Little Deer" Durvin's visit have been removed.